Sam Baldwin is a freelance writer specialising in travel and winter sports. as dozens of regional titles. 1001 Escapes, The World Snowboard Guide and Skiing Europe. the Czech magazines: Snow and NordicMag. expert on far flung winter sports destinations. anywhere with mountains and snow. Please contact editor@snowsphere.com for more information. SnowSphere.com, December 2005 – present. Features articles about ‘off the beaten piste’ locations, from India to Iceland, China to Chile. Snow-search Japan: Japan Ski Guide, WSG Media, October 2009. 1001 Escapes, Octopus Books, September 2009. Ask Men's Health – Sam appeared as travel expert on MH panel. A Line Less Ordinary – a series of columns exploring off the beaten piste snowboard destinations. Dirty Weekends – Borovets, Bulgaria (March 09 issue). Tribe Snow Sports Magazine, Spring 2009. Road Tripping the Republic: Snowboarding Slovenia – feature article with pictures detailing a snowboarding trip around Slovenia. Japan Society of Scotland Newsletter, Spring 2009. JSofS Newsletter – the biannual publication of a society that strives to promote cultural and commercial exchange between Japan and Scotland. Ski and Board, February/March 2009. Downhill to danger – slopes around the world where bombs or bullets are more of a danger than avalanches. Feature article. Grim Fairy Tales – skiing and snowboarding in fantasy worlds. Snow and the City – 10 suburban ski resorts. Skiing Europe, (Footprint Guides) November 2008. Overview and intro to Bulgaria & Slovenia – plus full review of Borovets. Getting piste on the cheap – with recession woes and a strong euro, if you want to ski on the cheap this season, you'll need to look beyond the eurozone. SNB World – a series of columns exploring off the beaten track snowboarding destinations (translated into Czech). Tribe Snow Sports Magazine, Autumn 2008. Monkeys and Machine Guns: Snowboarding Kashmir – feature article with pictures detailing a snowboarding trip to the Kashmiri Himalaya. i-on Edinburgh & Glasgow, September 2008. Life in the SLO lane – buying property in secret Slovenia. Japan Society of Scotland Newsletter, Summer/Autumn 2008. ACTIVE SPORT REPORT: Cool Kashmir; Skiing Gulmarg – Report for world's leading trend analysis magazine on the future of Kashmir and its place in the world of winter sports. Japan Society of Scotland Newsletter, Winter/Spring 2008. Tribe Snow Sports Magazine, January 2008. Goodbye Backcountry, Hello Cross Country – feature article with pictures extolling the virtues of the father of all snowsports: cross country skiing. Cross Country Skier, Jan/Feb 2008. Cross Country Skiing Around the World – Feature article exploring the cross country skiing options in far flung resorts of the world. Holy Sh*t – A Snowboarding Pilgrimage on Japan's Sacred Mountain. Come to Snowy...Kazakhstan – monthly column exploring the more mysterious peaks of the planet. Come to Snowy...Lebanon – monthly column exploring the more mysterious peaks of the planet. A Line Less Ordinary: Hawaii – monthly column exploring the more mysterious peaks of the planet. Come to Snowy...India – monthly column exploring the more mysterious peaks of the planet. Ski and Board, October 2007. Poles Apart? – is the skier vs snowboarder saga finally coming to an end? Feature article. A Line Less Ordinary: Australia – monthly column exploring the more mysterious peaks of the planet. White Lines Snowboarding Magazine, October 2007. Of Rails and Rice Paddies: a Season in Japan – feature article and pictures about an incredible winter spent exploring the snow-laden paradise of Fukui, Japan, a forgotten land where locals rule. Tribe Snow Sports Magazine, Autumn 2007. Of Lochs and Lines – feature article with pictures detailing two very different snowboarding experiences in the Scottish Highlands. Japan Society of Scotland Newsletter, Summer 2007. A Line Less Ordinary: Israel – monthly column exploring the more mysterious peaks of the planet. A Line Less Ordinary: Slovakia – monthly column exploring the more mysterious peaks of the planet. Snowshoes and Sushi; Roaming the Rice Paddies of Japan – Feature article with pictures about showshoeing through bamboo forests, over rice paddies and around the ancient temples of Japan. 20 articles on various aspects of snowboarding and other snow sports for new winter sports website. A Line Less Ordinary: Iceland – monthly column exploring the more mysterious peaks of the planet. Weathering Our Emotions – a look at the way in which humans experience weather not only as a regulator of their surroundings, but also as a regulator of their emotions and sensitivities. A Line Less Ordinary: South Africa – monthly column exploring the more mysterious peaks of the planet. Tribe Snow Sports Magazine, Winter 2007. Big In Japan – feature article with pictures detailing the Japanese snow experience, and the life of a seasonaire in Fukui, Japan. Japan's Tucker Tourists – feature article with pictures exploring the regional food specialities in Japan, and the Japanese food tourism industry. Fried bee larvae anyone? The Scotsman, 22nd Dec 2006. Over the Alps? Head out to the Highlands – round-up of the opportunities for winter sports in Scotland, appeared in the Sporting Scotland supplement of this national British paper. A Line Less Ordinary: Kazakhstan – monthly column exploring the more mysterious peaks of the planet. Snowboard Journal, Issue 12, Early Winter 2006. Of Rails and Rice Paddies – Feature article and pictures about an incredible winter spent exploring the snow-laden paradise of Fukui, Japan, a forgotten land where locals rule. Cross Country Skier, November 2006. Going Nordic In Nippon – Feature article and pictures introducing the joys of cross country skiing in Japan. World Snowboard Guide (11th Edition), November 2006. Written and photographic content for Japan chapter, (introduction to section, review for Katsuyama Ski Jam and other Japanese resorts), plus updates for Livigno, Italy. Japan's Winter Weather Exposed – feature article detailing the incredible record breaking snow storms that hit the land of sumo and sushi last winter. A Line Less Ordinary: South Korea – new monthly column exploring the more mysterious peaks of the planet. The Snowboarder's Handbook, September 2006. Making the best of any snow condition – two page article on how best to ride, whatever the weather. Appeared in print as part of a 150 page limited edition guide, published by Future Snowboarding Magazine. Hokkaido, Japan; crystal clear lakes, smouldering volcanoes – a camping road trip turns into a boat trip, from Honshu to Hokkaido, featuring Fuji Rock Festival and a burst radiator. The Funky Drummer, October 2005 – August 2006. Photo-journal documenting two years of adventures whilst living and working in rural Japan. Snowboarding on holy mountains, kayaking on deserted lakes, and snakes in school. Not to mention the sumo, sushi and sake. The World Snowboard Guide, May 2006. Introduction to Japan chapter, review for Katsuyama Ski Jam and updates for Livigno, Italy. Currently online and will be published in print in the new 2007 World Snowboard Guide book. The Fukui Fellowship – eating cow intestines atop holy mountains, knee deep powder on deserted slopes and an interview with a Japanese ski and snowboard posse. White Lines Snowboarding Magazine, March 2006. World’s Longest Rail? – short piece with photo about the world’s longest rail in Japan. Snowboarders V Skiers; The Dying Feud – it’s been a long fought battle, but have we finally reached peace on piste? 24 Hour Pod People – two page full colour cartoon strip collaboration with illustrator Neil Wade, showcasing the Japanese Capsule Hotel experience. White Lines Snowboarding Magazine, January 2006. Japan’s Micro Resorts – like their cars, cameras and computers, the Japanese have done with many of their ski resorts, the thing they do best; miniaturise. Turns and Conditions – a four page guide to getting the best out of the slopes when the bluebird powder day has gone A.W.O.L. The Fukui Ski and Snowboard Guide, December 2005. Comprehensive guide to the ski resorts of the Fukui area of Japan, including pictures, prices and backcountry trip reports. Written and compiled for the Fukui Japan Exchange and Teaching Programme(FJET). Published partly in print, with full version online. Fishing, Sushi Style – it’s fishing Jim, but not as we know it. A trout fishing trip in Japan turns out to be not quite what I expected. The JET set and Beyond – teaching English in Japan; a guide on how to do it and a flavour of life from the land of sumo and sushi. Snowboarding Sushi Style – the joys of snowboarding in the land of the sumo; one man powder days and beer from slope side vending machines. 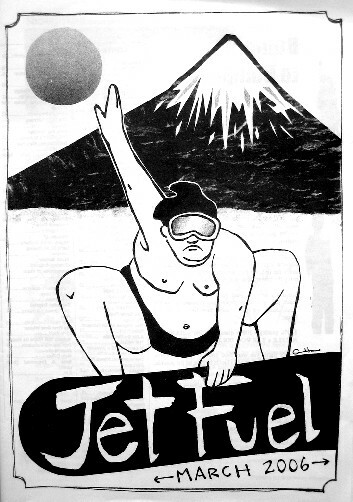 JETfuel, May 2005 – May 2006. Magazine for English speakers in the Fukui area of Japan. 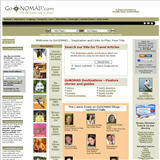 Publishes travel, humour, interviews, music and movie reviews, plus general interest. Break Beat and Enter – a British drum and bass DJ is attacked in his own home by crazed Japanese man.